Fences these days have clearly outgrown their original, slightly boring, purpose of marking the edge of your property and -in the best case scenario- giving a bit of security and privacy. Nowadays, fences are -or at least can be- design statements enhancing the beauty of your home, your front yard, your back garden. Done right, fences can draw the eye to those parts of your property you rightly want to show off, subtly encourage the charm or style of your home, or add this last touch of luxury and aesthetics that elevates your garden from well-planned to perfection. Cleverly designed fences frame your garden, highlight your landscape design, and provide a focal point to the overall image your home presents. A well picked-out fence will always emphasize your living-style, and should seamlessly blend with the overall look and feel of your property. In terms of material, your imagination is the limit. From the classic wood and/or metal construction, to brick, natural stone, logs, canvas, reeds or cleverly planted grasses, hedges, or trees, the possibilities are endless. And just as with material, density and height lie solely within your preferences. If you’re conscious about privacy, no gaps and extra height will feature high on your check-list. On the other hand, if neighbours or passers-by are little or no concern, widely spaced posts and light if any covering will help you to further emphasize the airy feel of a sprawling property. 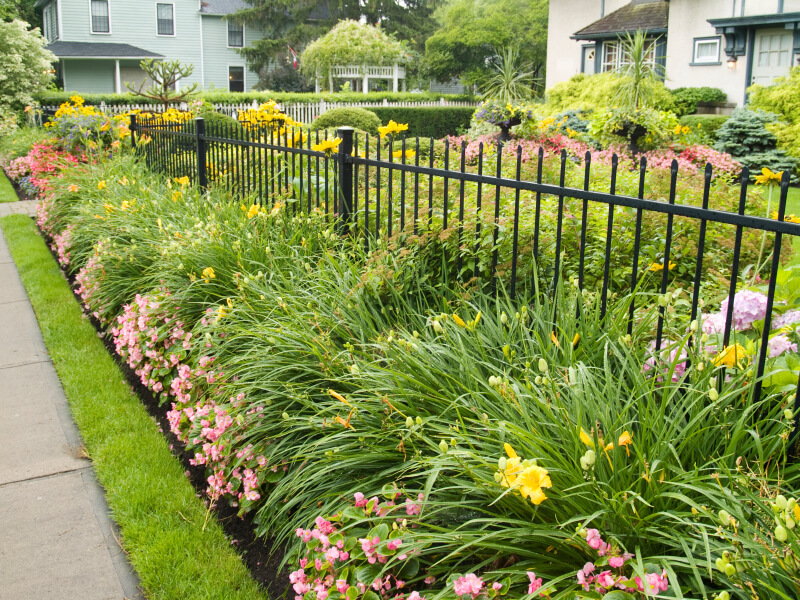 Additionally, you can use fencing to separate distinct parts of your garden. For example, a low hedge or small picket fence might look wonderful around your kitchen garden, giving your back yard a classic country touch. Or you could use a more sturdy, visually pleasing encasement to help keep children or pets protected, for instance to safeguard your toddler from accidentally falling into a pond or pool while playing. 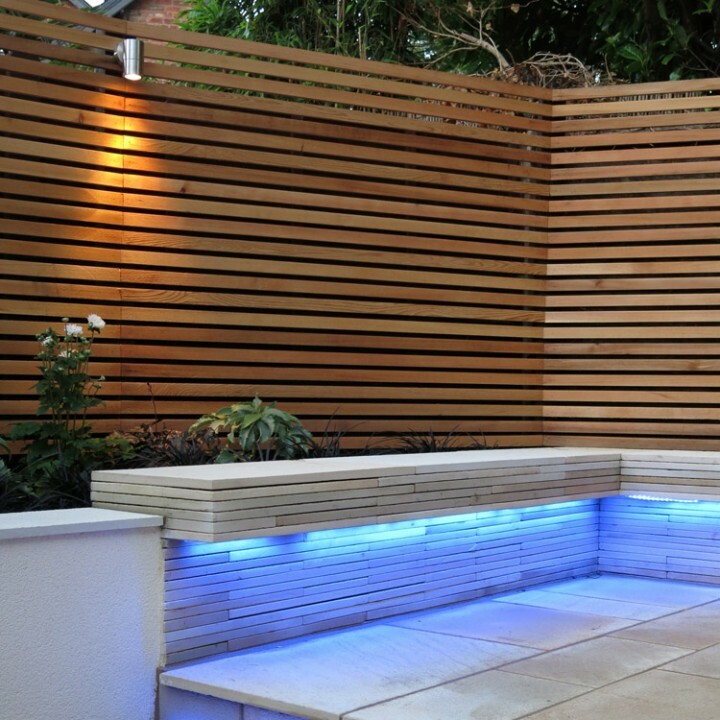 Coupled with cleverly laid out pathways, interior fencing can help create the illusion of a bigger space than your garden actually offers, simply by directing the eyes (and feet) to various secluded, and individually styled parts. 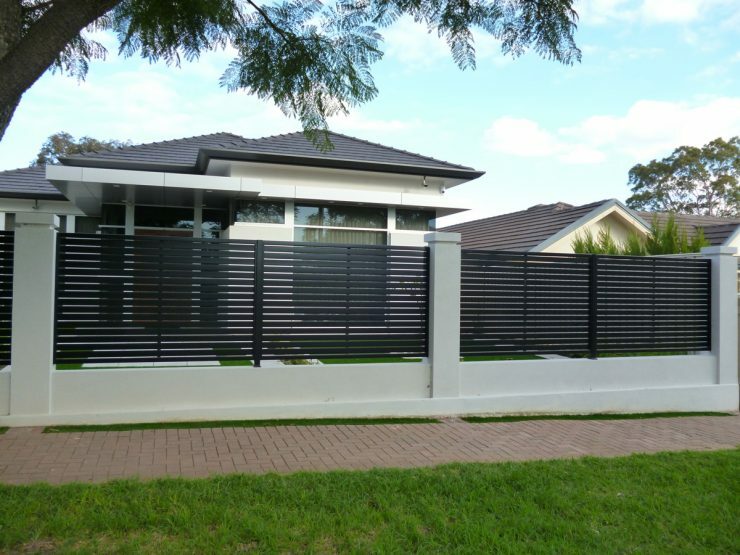 Below we’ve collected a variety of different styles and designs of fences that will serve as a great source of inspiration to help you settle on the type of fencing that will suit your property, needs and style best. A rustikal, yet clearly very modern look. For added style, combine slatted wood panels with chrome frames or poles. The perfect upgrade to an already existing brick or metal fence. Depending on the chosen height this combination also provides a particularly good measure of safety. Gabion is one of the most traditional ways of marking off a property. 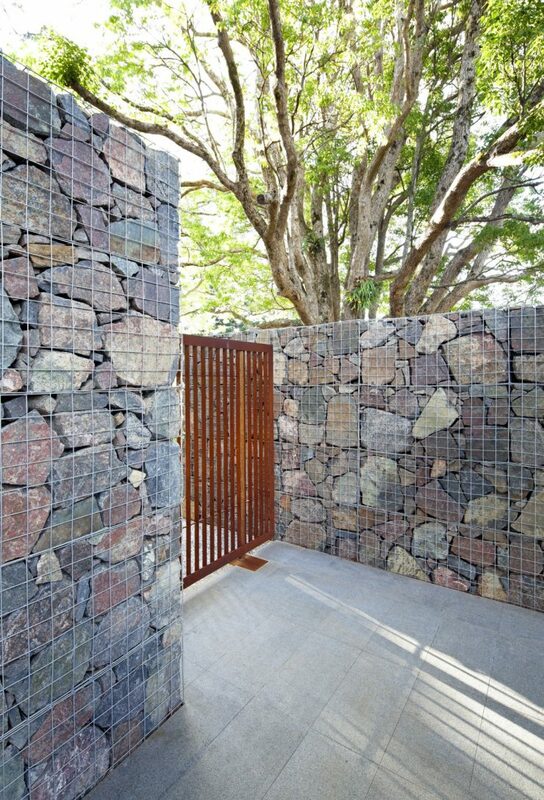 Full-scale gabion walls may be an acquired taste, but combined with wooden panels the stark look is tempered down considerably. Low gabion walls also make for beautiful borders around your terrace or pool area. Pallet fences are a great DIY project, or can be bought ready made. 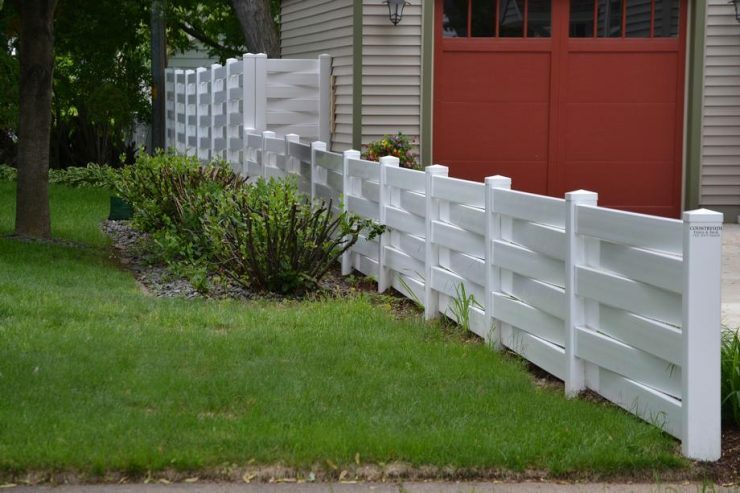 Depending on your preferences, pallet fences can be very upscale, or decidedly retro. They also can provide valuable shelving space around your seating area. Whether you prefer evergreens like ivy, blooming plants to please the eye in spring, shrubs that change colour in fall, vines, climbing roses or actual trees, the choice is all yours. 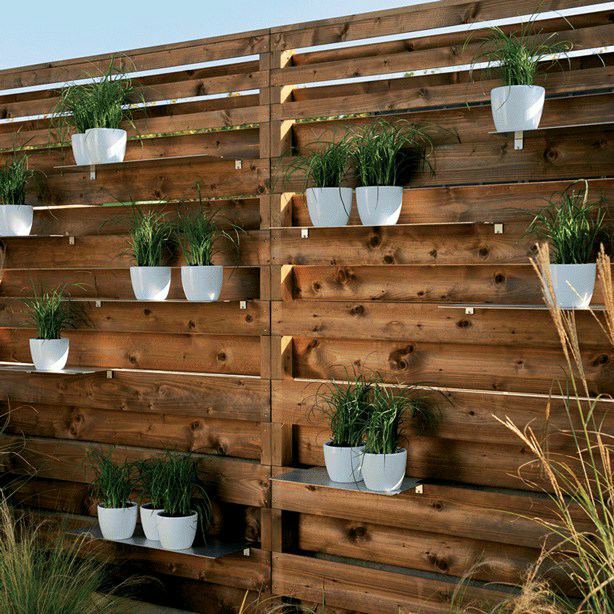 Living plants used for fences provide a great visual cover without you having to hide behind concrete walls. Lattice fences are a great way to set up boundaries without losing the view. 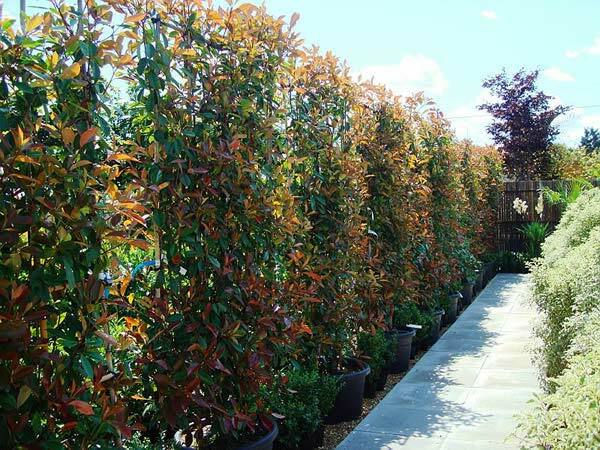 Should you need visual cover in some places, but don’t want to disrupt the overall design of your fencing, square lattice is also perfectly suited to support climbing plants or vines. 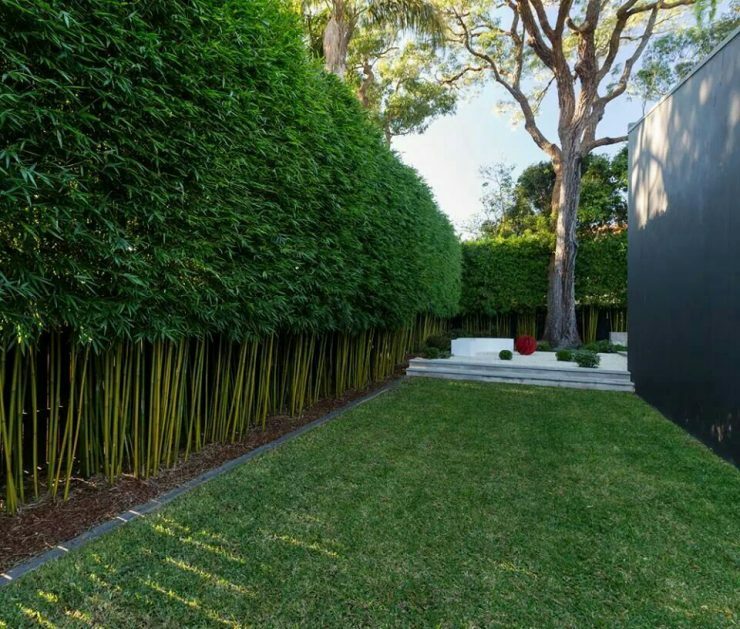 A unique, very modern twist on the classic climbing greenery fence. Bamboo is by far the fastest growing option of all live plants used for fencing, however because of that, they also require regular maintenance to not have them encroach on your garden space. The white picket fence is a classic for a reason. 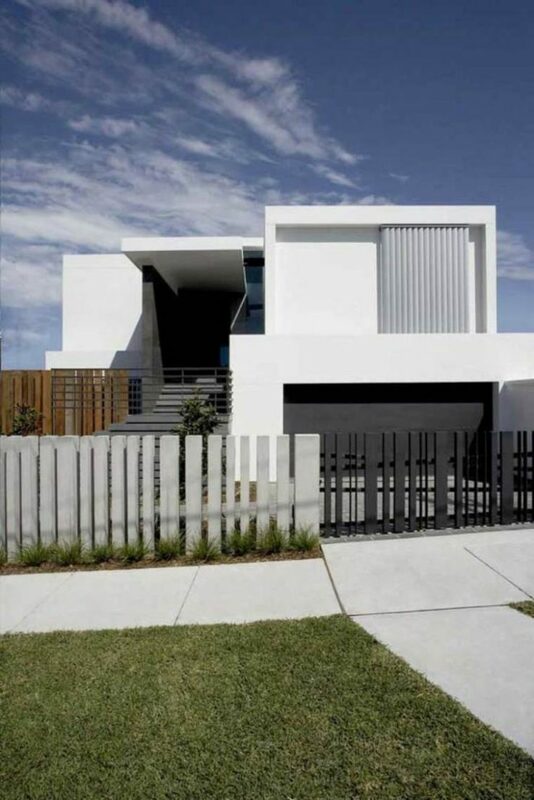 It is still one of the most favourite fence designs, but has evolved into a more modern, minimalist style in recent years. An upgrade of a classic that is well worth considering. Another fence that is available in a plethora of styles. 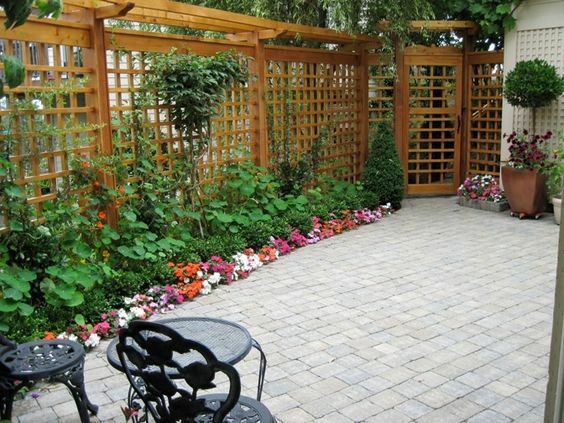 Basket weave fences look great as half-height borders to your garden, and provide wonderful visual cover when used in their full-sized variation. In white they provide a country-feel, in plain wood they are a classic design, and in a combination of wooden slates and steel frame they create a very chic, fresh look. And if you want something a little different: try using the weave horizontal instead of vertical! 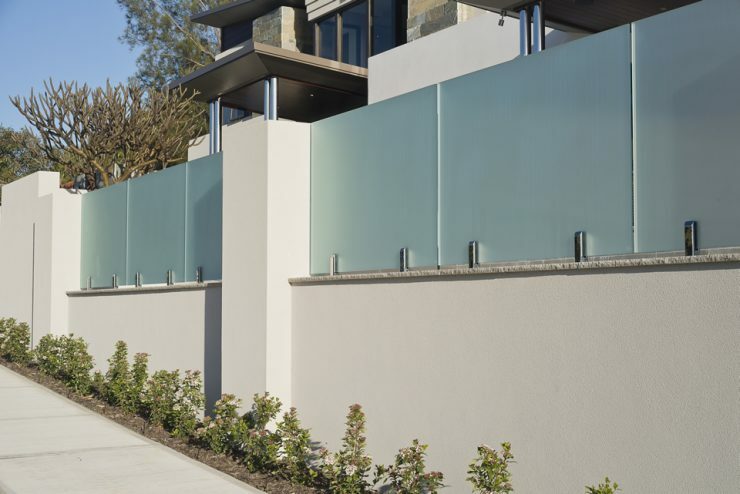 Frosted glass panels mounted on concrete or brick are a very stylish way to protect your garden from the eyes of passers-by without having to resort to high walls or massive wooden planks. Similarly, edging your pool area with frosted glass panels gives a measure of privacy without blocking out light. Another one of the classics of fencing. Wrought iron fences may be connected to stately homes or forbidding properties in your mind (they do pop up surprisingly often in Halloween flicks), but in the light of day they fit almost any property. 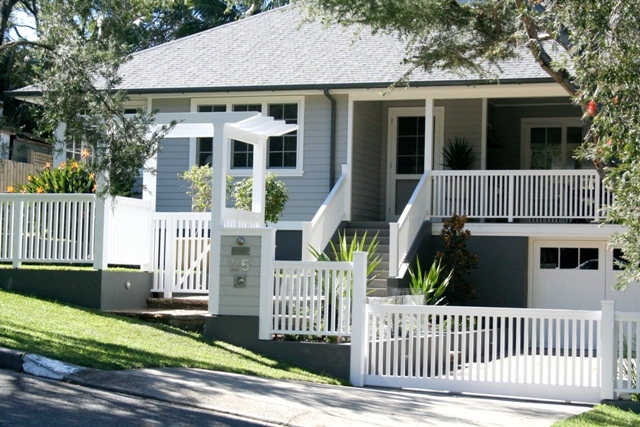 In their full-height version wrought iron fences provide great security (particularly if you chose the variety with spikes on top), with lovingly designed curlicues they can convey both elegance and playfulness, and their sometimes stark geometry softens considerably in connection with lush greenery planted around them – as can be seen in our example picture. Wrought iron fences are an incredible versatile choice of fence. Low concrete walls can look stunning when used as fencing, particularly in combination with modern buildings. Their stark geometry can beautifully emphasize a minimalist house design, and might pick up distinguishing design features of the building as well (for example a panel of glass etched with the house number echoing a glass front). 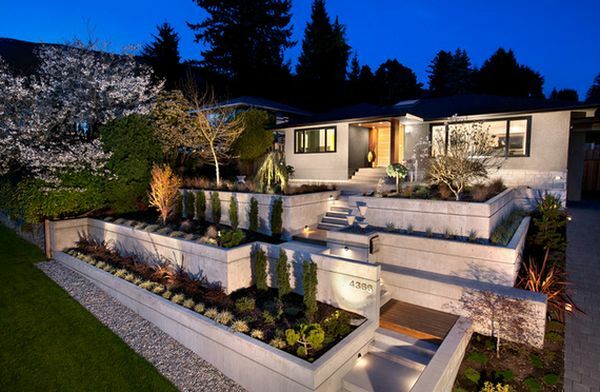 As shown in the picture above, low concrete walls can also be incorporated into the front yard landscaping, creating numerous sections or levels that lead the eye and give structure. The classic log fence is probably best suited for farm-style houses surrounded by sprawling grounds in rural areas. 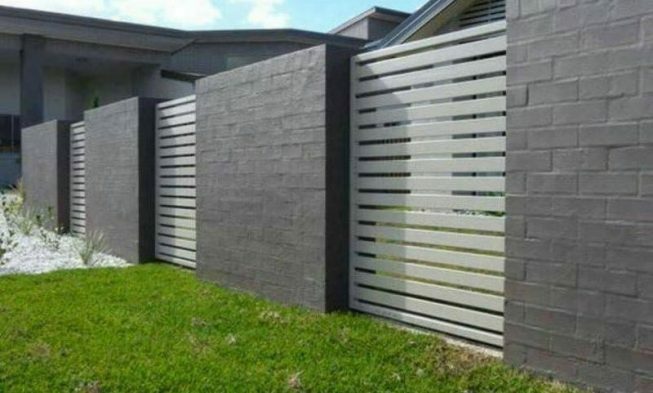 If you’re the proud owner of one of those, you probably already have this kind of fence in mind. However, there’s a new, modern approach to log fences as well. 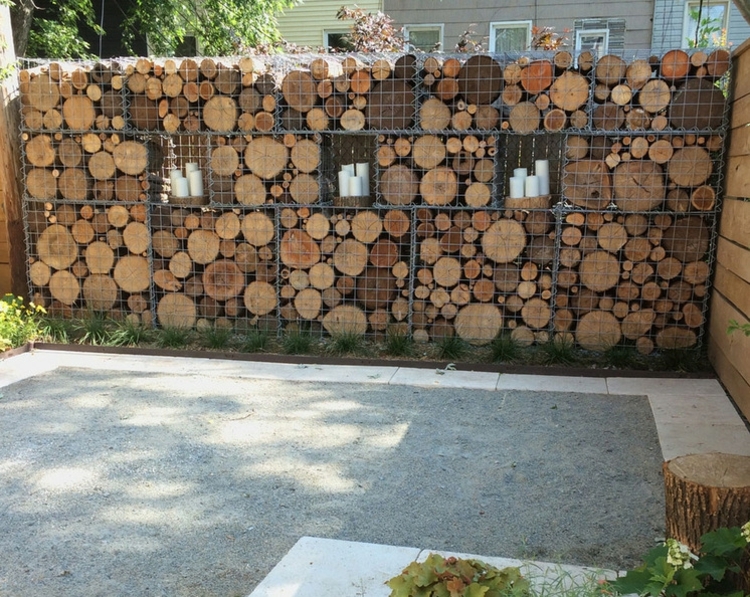 These fences are a gabion-inspired construction with logs stacked inside a metal encasing. This look is very unique, but can be a bit much when done in large quantities. We recommend using log panels to break up an otherwise uniform fence or wall at some selected places like near a seating area. You’re looking for something unusual? Then a laser cut metal fence might just cut it for you. These fences can be fancy, whimsical, romantic, geometric, or minimalist. 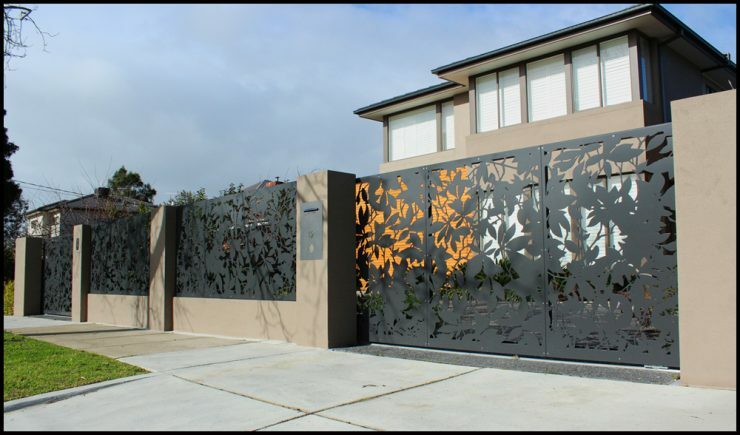 Whatever strikes your fancy and fits best with your property – if you custom-order your fence design your property will boast a truly unique and individual fence that will impress visitors and neighbours alike. A very easy to maintain, elegant type of fence that will never look out of style or place. In combination with white concrete the look is classy. Black slat panels interspersed with wooden panels can spice up a more natural look. You can’t go wrong with vertical poles – not in the least since there’s a whole variety of choices to pick from. Pole-fencing comes in a wealth of materials, from weathered wood to brushed iron, a multitude of colours, from natural to brightly varnished, and a near endless choice of forms, with, and height. And since you can set every pole exactly how and where you want it, there’s also no restriction when it comes to cunningly combining the various looks and sizes. Sometimes it is necessary to hide (parts) of your property behind a sturdy privacy cover. Most often, in these cases, a wall is the way to go. Thankfully, that doesn’t necessarily mean an ugly-to-look-at mountain of concrete. A wood wall, oftentimes made out of polished wood, is a great way to keep prying eyes out, and still be visually pleasing from the inside. 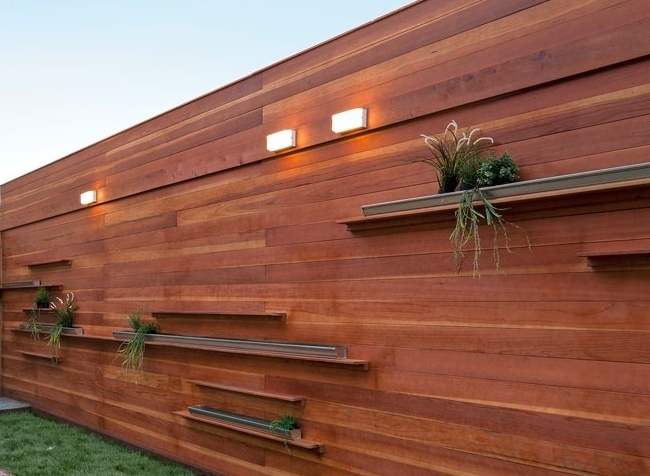 Set with lights, shelves, planters, and the like, these walls can serve additional duty as storage or herb garden. Vertical gardens are not only a lovely way to add a bit more colour to your life, they also manage to put a garden where there is too little or none. Whether around places like sprawling terraces or a pool area, or as addition to a small front- or back yard, vertical gardens give you the unique opportunity to cultivate plants or even grow vegetables while at the same time shielding your home from view.